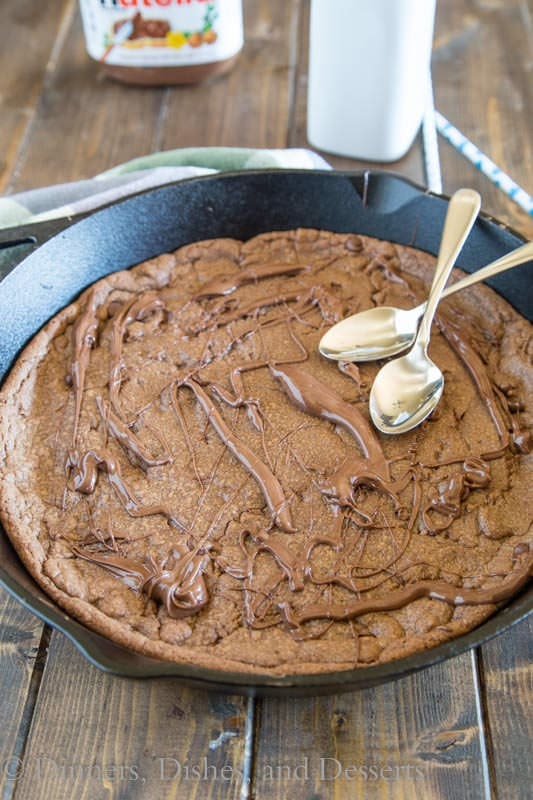 Nutella Skillet Cookie – a nutella based chocolate chip cookie baked into a cast iron skillet, with a layer of nutella in the middle! Any other chocolate lover’s out there? Seriously, I could eat chocolate all day every day and be happy! 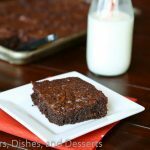 Homemade brownies are pretty much my ultimate weakness. When I was growing up, dessert wasn’t dessert if it wasn’t chocolate. I have branched out a little as I have grown up. I am a pretty big fan of Cream Puffs these days. But I still think chocolate is king. Cookie skillet is one of my favorite desserts. 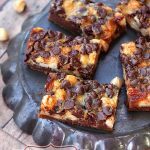 The warm gooey chocolate is pretty much the ultimate for any chocolate lover. 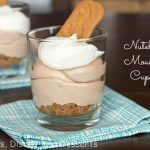 And if you like Nutella desserts, this is exactly what you are looking for. 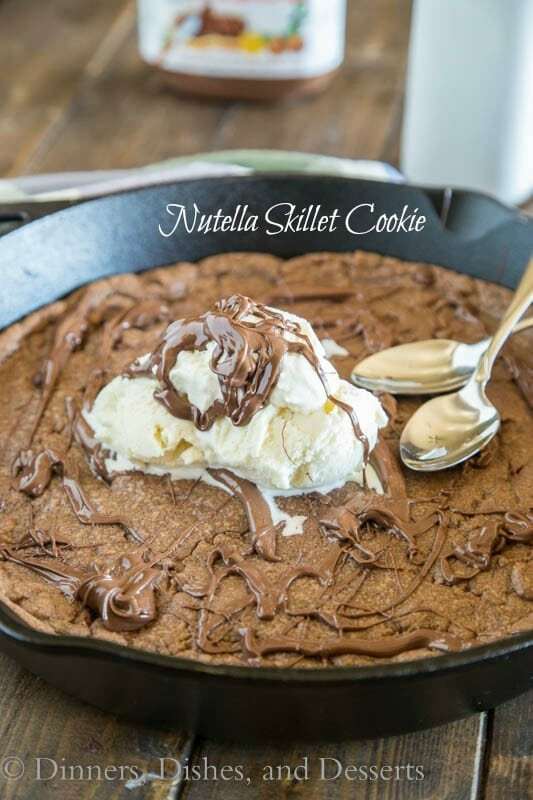 A skillet cookie is a cookie that is baked in a skillet. 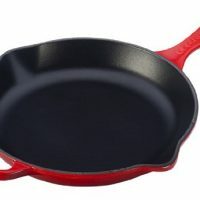 It can be a cast iron skillet if you have one, or it can be any other skillet that is oven safe. It can even be a cake pan if that is what you have. You really just want to bake the cookie so it all together in a pie shape. The center stays nice and gooey and it is pure perfection. You can make mini skillet cookies in small skillets if you have them. They are great to serve individually if you have little ramekins or small skillets to bake them in. 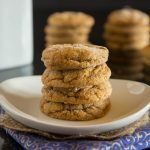 If you are using a cast iron skillet, I like to put in the cookie dough (pretty much any kind of cookie dough works) and make sure that I am not pressing it out all the way to the edges. If you leave about a 1 inch boarder your cookie will spread as it bakes and you will not get super crispy edges. If you like the crispy edge, then go for it and spread it all the way out. Once the dough is in the pan just bake until the edges are browned and the center is just set. The skillet will keep a lot of heat for awhile, so it will continue to cook after you remove it from the oven. You want the cookie to just barely be done when you take it out, or it will be over done by the time you eat it. 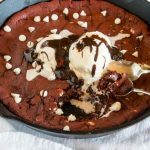 Earlier this year I shared a Triple Chocolate Skillet Brownie with you. I thought it was time to break out the cast iron again for this cookie. 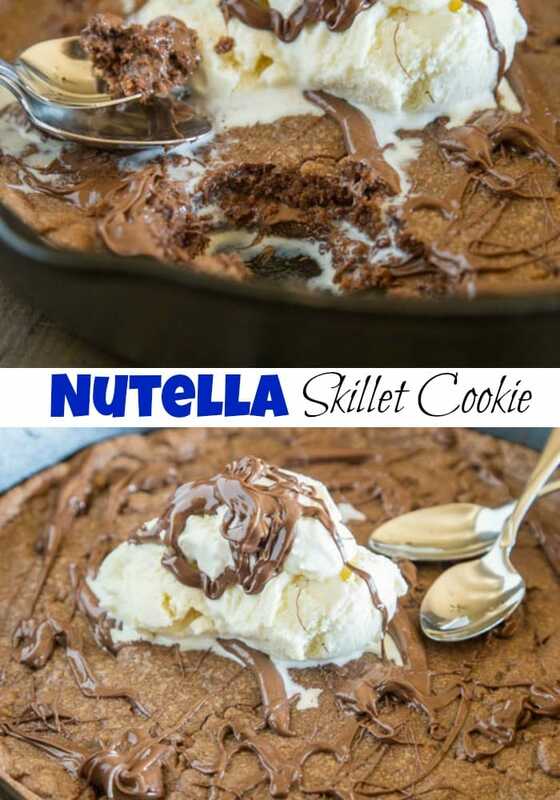 There is a restaurant here that has a Nutella skillet cookie on their menu that is just to die for. Or if you want to go with the fancy name it is a pizookie! 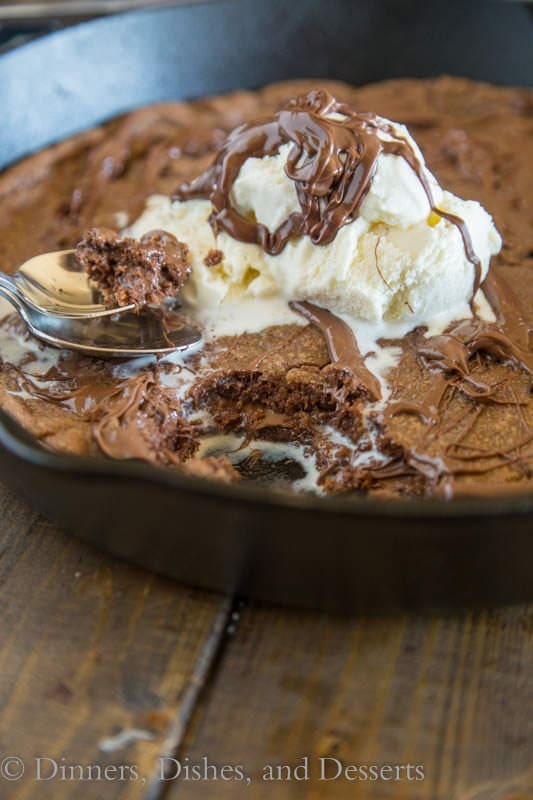 This skillet cookie was so over the top gooey, and delicious. Not only is Nutella mixed in with the cookie dough, I spread Nutella in the center of the cookie as well. See….. You can see gooey Nutella peaking out when you break into the cookie! Just like a pizookie at restaurants, this is best served warm. 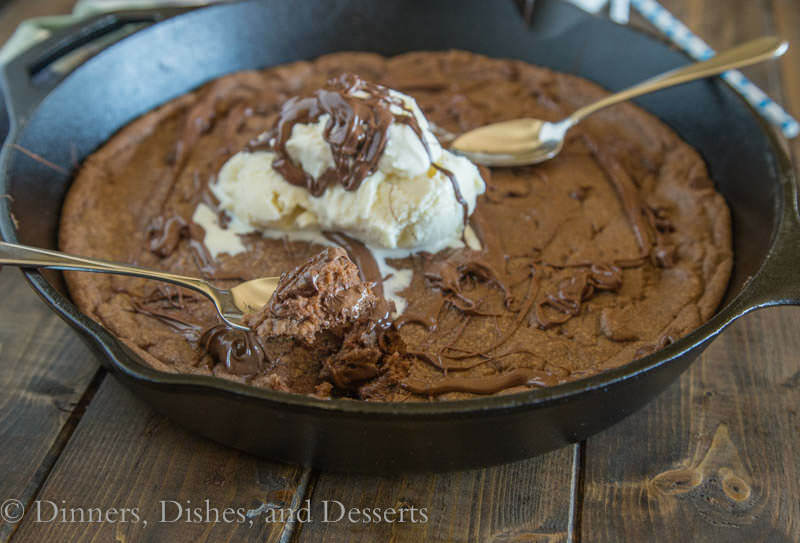 Just bring the whole skillet to the table, put a few scoops of ice cream in the center, and let your guests dive in. If you want to be more dignified, you can let it cool and then slice. But let me just tell you. There is something about warm gooey Nutella that you are willing to throw dignified clear out the window! 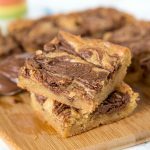 And of course you can drizzle on more Nutella, right? You want everyone know how what they are eating. 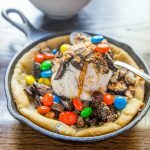 This Deep Dish Chocolate Chip Cookie for Two is kind of the classic small pizookie, made for just a single serving. But I kind of like this bigger version to share with your whole family. 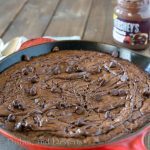 Nutella Skillet Cookie - a nutella based chocolate chip cookie baked into a cast iron skillet, with a layer of nutella in the middle! Preheat oven to 350 degrees. Prepare a 9 or 10 inch cast iron skillet. Spray lightly with non-stick spray. If you do not have a skillet, a 9 inch baking dish will work. In a large bowl mix together butter, 1/2 cup Nutella, and brown sugar. Add egg, yolk, and vanilla. Beat until well blended. Stir in flour, baking soda, and salt. Divide the dough in half. Spread one half of the dough into the base of the skillet. Leave a 1/2 inch boarder around the edge. It will spread when baking. Spread 1/2 cup of Nutella over the base of the dough. Top with remaining dough. Oh my gooooood this looks incredible. Love it! I always make decorated sugar cookies. Delicious and fun! I mean, really, who in their right mind could NOT love the looks of this? This cookie is sheer perfection Erin. I want to do a high dive right smack into the middle of the skillet and eat my way out. I love my cast iron pans, they are perfect for baking things like this. I need to break out the nutella, I don’t use it enough. My Nutella is hidden deep in my pantry! I may need to dig it out just to make this baby…it looks superb! Since Nutella at our house is generally eaten straight from the jar with a spoon, dignity has been long gone in its presence. This sounds like the perfect family dessert, Erin. And may the fastest spoon win! Oh I haven’t had nutella in a long time either. This cookie…the whole thing would not last long. Oh my yum!! 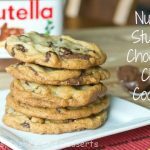 I absolutely love nutella and finding any possible excuse to cooke with it, so I have definitely found my next dessert! 🙂 Pinning, Stumbling and Yumming! Thank you Maggie! It is on of my favorite things ever! 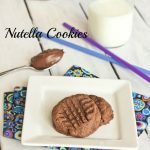 Nutella is a favorite treat at our house, so this was a big hit. It’s best with vanilla ice cream and Nutella drizzle. So good! OH my goodness!! This looks so so so delicious!!! My mouth is watering! I can’t wait to make this. There is nothing like a giant cookie and especially one that is made with NUTELLA!! Looks too sinful to eat! OH… who am I kidding?!? Hand me a spoon! This looks like a dream! Need to make soon! My kid loves Nutella everything! I will try this recipe! This is so good! 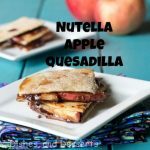 Love the flavor the Nutella adds! This is like a dream come true! Heaven in every bite! You had me at the word Nutella! 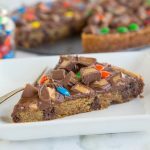 What a great recipe for a birthday cookie cake. I’m saving this recipe for the next birthday party!